Are you ready? 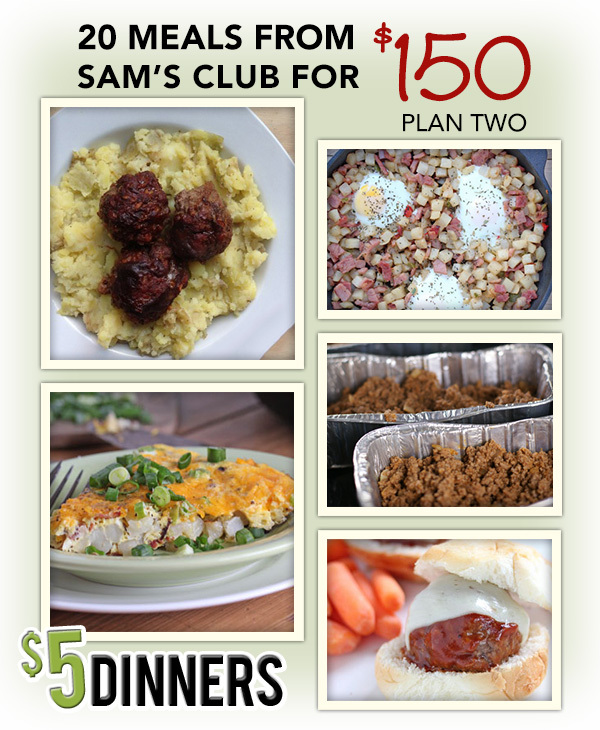 We’ve got another awesome meal plan for 20 Meals at Sam’s Club for $150! A note about Tuna ~ If you prefer not to use tuna, then you can purchase canned chicken that you can substitute instead. 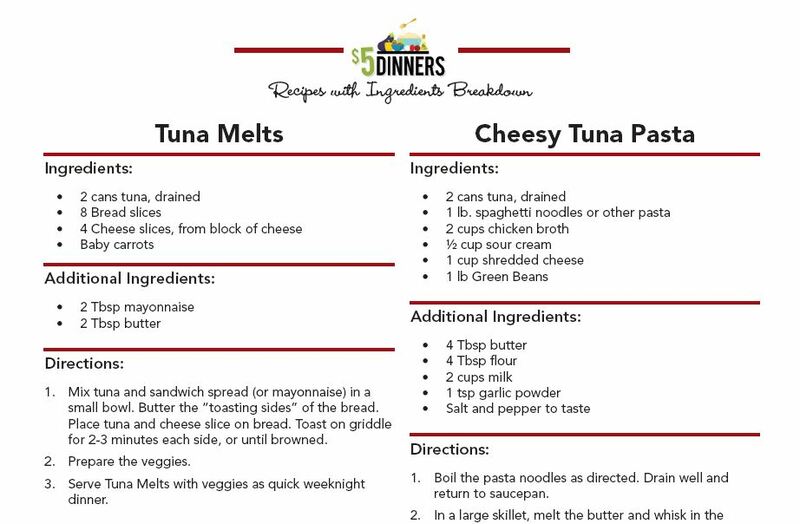 All tuna recipes can use canned chicken or purchase additional chicken breasts, cook them in the slow cooker so they are soft and easily shredded and use as a tuna substitute. We did a live chat for the Costco Meal Plan #2, walking through the plan, the recipes and the ingredients. I share tips and tricks for each recipe that also fits with the Sam’s Club meal plan. I hope the video is helpful to you in understanding how this all works! Follow $5 Dinners on Pinterest, too! I did not reflect these “leftovers” in the total cost, so it would really be about $20 less than the total price!!! Complete Printables of All Shopping Lists, Recipes, and Ingredients all in one place – for only $4!!! So simple with everything in one place! 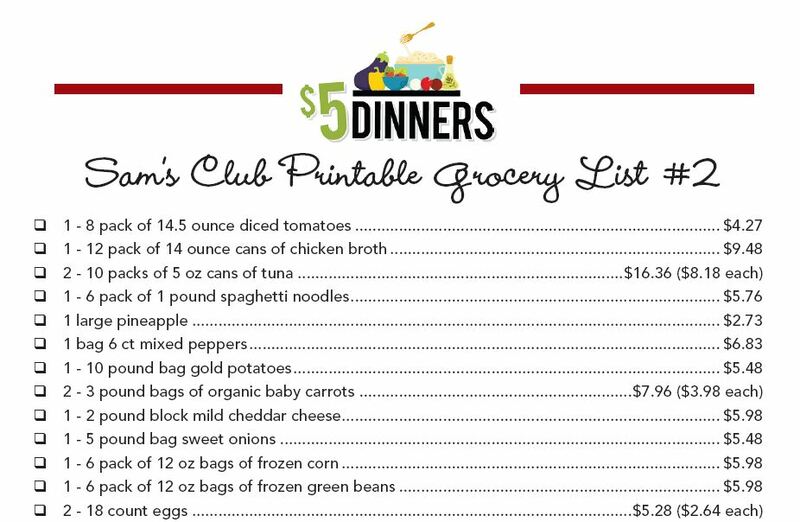 Don’t forget to check out all of the other printable meal plans and e-cookbooks in the $5 Dinners Store! Yes, I realize this makes for roughly $7.50 dinners. Mostly that is due to the cost of meat at Sam’s Club. You can lower the cost by shopping for your meat elsewhere when it’s on sale etc. Plus, you’ll have LOTS of leftovers, which you’ll see in the video below that helps reduce the actual meal prices down! Produce prices may vary by region. And season. Meals are for a family of 4. Larger families, or families with teenagers will need to adjust quantities. Meals are as kid friendly, family friendly, and allergy friendly as I could make them. Hopefully you will enjoy them! Mix and Match Meals – because of the bulk purchasing, this is really a game of mixing and matching ingredients. The ingredients are very common and work in a wide variety of recipes, so feel free to use them in other recipes besides those listed below. Nothing is set in stone! Some pantry and fridge ingredients like milk, butter, spices etc. are not listed on the Sam’s Club Ingredients List, since most household already have those items. However, every ingredient you need for each recipe is listed on each individual recipe linked below AND on the Sam’s Club Printable at the end of the post. Brilliant recipes! I’ll be trying a couple of them this week. Unfortunately I don’t have a Sam’s Club near me, but there are a few other discount supermarkets that I can try. Should be plenty of leftovers!! However, I have only made 3 complete recipes of this so far. I have a few that are half-prepped. One note about the first meatball recipe is it does not say when to add the egg. Veterans will know when to add the egg, newbies won’t. Tonight I made the cheesy tuna pasta and it was a bit runny, but nothing that adding another can of tuna, some broccoli, and some bell peppers can’t fix. It still tasted very good and now I have a ready-made meal in the freezer for a different night because it made so much. I will add some Parmesan cheese on top next time we eat it. I think this is more on the difficult side of the meals but it was still totally fine. I am getting good use out of my new cast iron skillet too! Thank you so much for making this so affordable to buy. This is so well organized and I appreciate all of your hard work! I hope you’ll do a new one soon that reflects the summer season. Please do more of the Sam’s club meal plans! You do such a great job picking meals that are quick and my picky children will enjoy! This is such a life saver to help plan the monthly menu! I would love for you to do a BJ’s wholesale club plan please!!! Giving this meal plan a shot this month! I know you didn’t factor in the cost of “leftovers,” which brings the price up a bit, but even factoring them in, it’s closer to $200 actually (and I couldn’t find “gold” potatoes, substituted red). Still, looking forward to eating a lot of this!